Your shade tree may be in peril. Landscape trees of many types, but most frequently pin oaks, are getting bacterial leaf scorch disease by the droves. 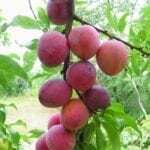 It was first noticed in the 1980s and has become a rampant enemy of deciduous trees across the nation. 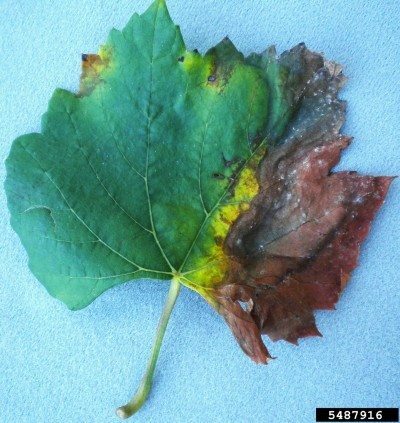 What is bacterial leaf scorch? The disease is caused by a bacterium that interrupts the flow of water in the vascular system of the tree with often dire consequences. Read on to learn more. Shade trees are prized for their regal dimensions and comely leaf displays. Bacterial leaf scorch disease seriously threatens not only these trees’ beauty but also their health. The symptoms may be slow to notice at first, but once the disease takes fire, the tree is often close to death. 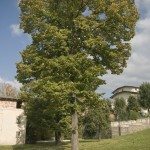 There is no treatment or bacterial leaf scorch control for this disease, but there are some cultural steps that can be made to ensure a beautiful tree for the last few years of its life. Bacterial leaf scorch is caused by Xylella fastidiosa, a bacterium that is spreading across the eastern and southern United States. The first signs are necrotic leaves with browning and finally leaf drop. Leaf scorch starts at the edges or margins of the leaf and produce browned edges while the center remains green. There is often a yellow band of tissue between the brown edges and green center. The visual symptoms differ from species to species. Pin oaks exhibit no discoloring, but leaf drop does occur. 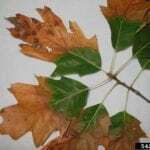 On some oak species, the leaves will brown but will not drop. The only true test is a laboratory test to rule out other diseases and cultural causes of marginal browning. There are no chemicals or cultural methods for treating bacterial leaf scorch. Expert recommendations on how to treat bacterial leaf scorch are just panaceas at best. Basically, if you baby your tree, you can get a few good years out of it before it succumbs. Death occurs in 5 to 10 years in most plants. Applying supplemental water, fertilizing in spring and preventing weeds and competitive plants from growing in the root zone will help but cannot cure the plant. Stressed plants seem to die more quickly, so it is advisable to watch for other disease or pest issues and combat them immediately. If you wish to try to keep the tree longer or removal is impossible, use good cultural methods to improve the tree’s health. Prune off dead branches and twigs. You may also wish to enlist the aid of an arborist. These professionals can provide an injection containing oxytetracyclen, an antibiotic used in treating leaf scorch. The antibiotic is injected into the root flare at the base of the tree and must be repeated annually to add a few years to the tree. The injection is not a cure but simply a method of treating bacterial leaf scorch and enhancing the tree’s health for a period of time. Sadly, the only real way to effectively combat the disease is to choose resistant tree species and remove infected plants.